The copy reads, "Franklin never patented his creations because he believed people should have the freedom to modify and improve them…that’s why most of his inventions are still important today." I wonder what he might have thought of all of the copyright restrictions and intellectual property rights we have today? I know I have experienced this myself, wanting to share the credited artistic work of others, in music or writing, but not able to afford it. I could not let the words “it’s the same old song but a different feeling since you’ve been gone” play from a radio in one of my stories without paying top dollar, or share the music of Mary Martin on a podcast to a generation who may not have ever heard her before. It does seem like a surefire way to be lost to the ages. Just another way Ben was ahead of his time, I guess. Have a glorious fourth! Book-a-Day is taking a long holiday weekend, check back on the 5th for more reading recommendations. Okay, I generally prefer to let you know about books that you might not know about otherwise, and heaven knows this latest book by Ian Falconer is bound to be face-out at every superstore. But if you don't know Olivia, you must, and if you do know Olivia, you'll want to know that the latest is out. What I really like about HANNAH WEST IN THE BELLTOWN TOWERS by Linda Johns (Sleuth/Puffin) is that even if you aren't a big mystery fan, the situation and characterization will hold you in a grip. Hannah West, adopted from China as a baby, is now a twelve-year old living la vida artist with her struggling single mom who keeps them off the streets by house-sitting in a swanky Seattle apartment building. Maybe Hannah's unconventional backstory is what gives her the ability to look at the world in new ways, making her an extraordinarily gifted--and likable--sleuth. The disappearance of paintings before an auction is the context of this very fine art caper, and though perhaps it lacks the heady precociousness of Blue Balliet's popular CHASING VERMEER, for many intermediate readers it will be a good deal easier to follow and a nice preface to the genre. THE RAVEN LEAGUE by Alex Simmons and Bill McCay (Sleuth/Razorbill) takes us back to Victorian England to find an age-old problem: kids being left out of clubs. This time, though, the exclusive club blackballing Archie Wiggins and his buds is the notorius Baker Street Irregulars, the team of ragamuffins that helps none other than Sherlock Holmes. Not only do the misfits solve the mystery of the missing detective, but through friendship, cooperation and cunning, they are able to form a league of their own. Short and sophisticated, this clever little tome adds a tasteful dose of historical fiction, and will find a lot of fans and friends among young mystery readers. If you have a favorite mystery, be sure to share it in the comments section! This is a very interesting pairing of author and illustrator. Darcy Pattison recieved a lot of classroom kudos for her kiddie-Kerouac homage to the open road, THE JOURNEY OF OLIVER K. WOODMAN (Harcourt), and Steven Salerno's illustrations have a kind of retro "Tom Terrific" swirly-curly bouyancy, lines loose and tumbling and with a palette so fresh, it always looks like the paint just might still be wet. I also love his other recent offering, the bilingual romp BEBE GOES SHOPPING with Susan Middleton Elya (Harcourt), and his slick and seriously bubblicious rendering of Margaret Wise Brown's THE DIRTY LITTLE BOY (Marshall Cavendish) is one of my storytime favorites. His special touch speaks most 'specially to the preschool set. Well, if I had been really good this weekend, I would have been working hard in my garden, but I seemed to prefer reading to weeding for the most part. So here is a season's worth of heirloom variety children's books that are sure to help children's love of reading grow and grow and grow! Forgive the oldies but goodies, but if it is a garden of reading, it's only natural to include perennials. Make garden hats by using corrugated "Bordette" bulletin board borders (sold at teacher supply stores). Wrap a length of the border around the child's head and staple to secure and form a "crown." Decorate the tops of green pipe cleaners with flowers and leaves designed out of tissue paper or construction paper, and then tuck them in the holes in the corrugation. Instant wearable garden! Follow a reading of TWO OLD POTATOES AND ME by John Coy, illustrated by Carolyn Fisher (Knopf) with a game of Hot Potato: play music while children sit in a circle, passing a potato around.When the music stops, the one holding the potato is out, and the last person not holding the potato gets a prize. A British variation of the game is towrap a gift in many layers, and whoever holds the package gets to unwrap a layer. Whoever unwraps the last layer gets the prize! This method produces screaming fun, and nobody has to be "out." You can wrap a potato for this game, but books also make very good prizes! 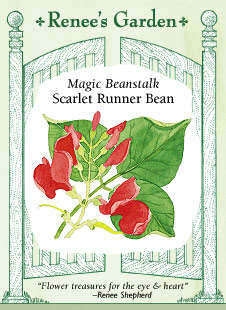 Read your favorite version of Jack and the Beanstalk,(mine happens to be the version retold byAnn Keay Beneduce, illustrated by Gennady Spirin) and then pass out "Magic Beanstalk"seeds from Renee's Garden. These beans really do seem magical; when they grow, they form a lovely long vine with red flowers that reach up to the sky, and inside the pods are shocking purple/fuschia colored beans. Make a garden meal! Children might actually eat their vegetables after reading about how they are grown (I said might). Gazpacho, green salad, salsa, crudité, watercress sandwiches, stuffed zucchini, veggie pizza, fruit pie, lemonade, or let the children produce their own inventions using produce! Be sure to have recipe cards available, in case children need to write their cooking secrets down. Some good recipes may be found in THE CHILDREN'S KITCHEN GARDEN by Georgeanne and Ethel Brennan (Tricycle) (sadly out of print but stil available used or in libraries) or Mollie Katzen's new step-by-step illustrated cookbook for children, SALAD PEOPLE (Tricycle). Read and eat the classic GROWING VEGETABLE SOUP by Lois Elhert (Harcourt), and with the leftovers, create your own crunchy characters using black-eyed peas and the models in HOW ARE YOU PEELING? FOODS WITH MOODS by Joost Elffers, Saxton Freyman (Scholastic). Be aware that within some circles of early childhood educators, there has been discussion about whether or not food should be used as a plaything or art supply when so many children around the world are hungry. This is a point worthy of consideration; food should always be treated with reverence and gratitude. Consider eating your art! Read about MISS RUMPHIUS by Barbara Cooney (Penguin) who changes the world one lupine at a time, and then set out still lifes of blue and purple flowers in vases, along with temperas of blue, violet, green and white. Let the children paint away! Mixing salt into the paint also creates an interesting effect. Once the paintings are dry, you can cover them with clear contact paper to make them into placemats. Or, let the children paint on paper plates and punch holes in the top; string with ribbon so the paintings can be hung easily. Doesn't the world look beautiful? Decorate envelopes and fill with wildflower seeds to create a "Secret Garden" mix, or create "Grow a Reader" mixes featuring seed packets that look like covers of favorite books (ALISON'S ZINNIA by Anita Lobel [Greenwillow], anyone?). 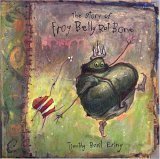 For the full package, accompany with the odd and funny STORY OF FROG BELLY RAT BONE by Timothy Basil Ewing, who incidentally, is the illustrator of Kate DiCamillo's latest (Candlewick). Decorate a small pot by using acrylics to paint a fun face on to it. Then fill with soil and grass seed. Soon the children will have long-haired friends. Take that, Chia Pet! You may want to recommend TOP SECRET by John Reynolds Gardiner (Little Brown), an intermediate novel in which a boy's science fair experiment on photosynthesis goes terribly awry. There are so many great books that relate to things that grow; many more are listed at PlanetEsme.com, and you are of course welcome to post your own in the comments section! "After reading HARVEY POTTER'S BALLOON FARM by Jerdine Nolen, illustrated by Mark Buehner (Harper) I told the kids that I had found a "conjure stick" that really worked. It was my 10 inch mascot for the year, a green and white stripped book worm that was fabric and had a bendable wire inside his skinny little body. I had straightened him out (literally) and told the kids that he was a great conjure stick. Before going into their class I had blown just enough air into a balloon to make it stand up straight, tied it off, taped it to a broken popsicle stick and "planted" it into a small terra cotta pot full of dirt. I kept it hidden until the story was over, then told them about the conjure stick, that I had said eeee ya ya ya over it and 'boing' it had started to grow. They of course were skeptical. Before leaving I gave each of them a "seed" (un-blown balloon...is un-blown a word?) and told them, all they had to do was find just the right conjure stick. Over the next couple of days I replaced the 'growing balloon' with new larger ones so as to make them think it was growing. We live in a very small farming community in Ohio...so needless to say...I was "sweetly scolded" for telling them they could grow balloons. One mom called and said her daughter (who has grown up to be one of the MOST imaginative, well read kids I've ever met) was driving her crazy. She was in the corner of the field with the balloon in the ground waving all different size sticks over it and screaming...eeee ya ya ya ya. hee hee hee ...I love it when a plan comes together!!! But the absolute best was Colby...a died in the wool doubter of the unbelievable kind. He has farming blood in every vein from every side of his life. BUT...he has a great mom that is creative. When she found the balloon in Colby's backpack, he said it was from a story that Mrs. Collins' read, and repeated most of the story (yeehaa Colby!). Mom talked him into planting it and waving a yard stick over it. Colby was doubtful. The potting soil was in the closet with the water heater. It was warm. They planted the "seed" and hung it over the edge of the pot. Then they left and went to town. Colby left the potted balloon in the garage. The garage was cold. Need I say more? Let science be your guide. When they came home....TAA DAA...the balloon was standing straight up and I had a full blooded balloon farmer believer on my hands. He couldn't WAIT to get to school to tell me and all hisfriends....'it's a miracle' I believe were his words. His balloon never got any bigger...but it didn't matter....for one moment in time....every possible dream he could ever dream would come true...no holds barred!!!" A lot of people think that Miss Pointy, the teacher in SAHARA SPECIAL, is me (which she is, when Miss Pointy loses her temper). But the best qualities of the character were actually inspired by the remarkable Ms. Liza Airo (pictured, she's the one on the right). Not only is she my teaching inspiration, she is a gardening inspiration! 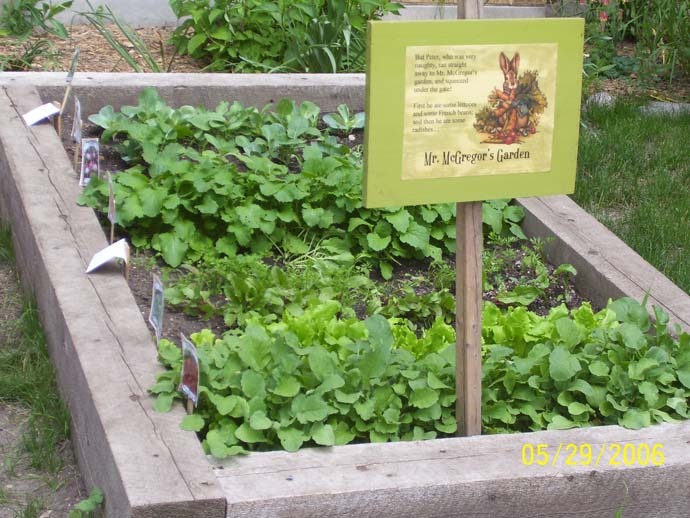 She started a whole school literacy and gardening initiative, creating thematic plots for different grade levels, integrating children's literature every step of the way. 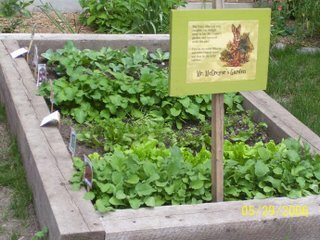 Mr. McGregor's Garden included cabbage, lettuce, carrots, radishes, beets, turnips, cauliflower, onions; the Native-American influenced "three sisters" garden was home to squash, corn and beans; Shakespeare's garden was where plants referenced in A Midsummer Night's Dream and A Winter's Tale grew; and purples and blues and a miniature bridge delighted the eye in Monet's Garden. All of the children in the school helped with the gardens, and were introduced to accompanying literature. 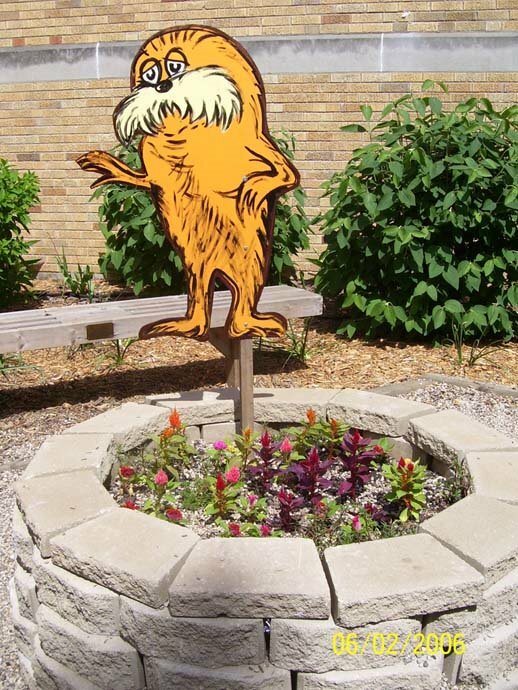 Of course, Dr. Seuss's LORAX watched over all this hard work (pictured above). Please note: Ms. Airo is also very handy with a table saw. Over the weekend Queen of England threw quite the 80th birthday bash , an enviable party featuring storybook characters and lovely finger sandwich picnic lunches! I'll have to remember that when I am queen! Come on, people! Don't be shy! Send me your questions at esmeatripcodotcom, anything you've wanted to know about children's literature but were afraid to ask. I'll start answering them next week. I need to congratulate MotherReader on her inspired reading promotion, the 48 Hour Book Challenge. She sent a lot of page-turning power out into the world with this initiative! 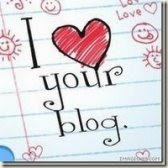 Visit her post, where you will also find a sampling of wildly brilliant and dedicated children's book bloggers. The victor of MotherReader's challenge was Midwestern Lodestar, just take a gander at the incredible list, over three thousand pages! I bow to you! 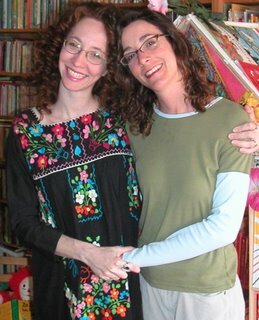 I was a bit out of the loop myself, being new to the blogosphere and trying not to lurk too much on other people's blogs as I develop my own, but I'm excited to join the fun of this reading marathon next year and hope all you new children's booklovers will get into training so you can, too! Also, a special thanks to AnnieM at Annie's Books who participated in the Challenge and happened to post a very generous review of my memoir /journaling springboard for kids, SING A SONG OF TUNA FISH, which will be released in paperback in about a week. Had a wonderful time appearing at the Book Cellar, on an esteemed panel with Chicago talents Aaron Reynolds, Amy Krouse Rosenthal and Sean Callahan. Special thanks to all who attended and to Susie, our lovely hostess, who gave my son and husband super-sized pretzels! With all of the hype that Jack Black's movie Nacho Libre is getting, I can't resist resurrecting this review! If you have any formal questions about reading, literacy, book recommendations or children's literature, won't you please send them to me at esmeatripcodotcom with the subject heading "Dear PlanetEsme"? Your questions will be considered for an upcoming children's book advice column here at PlanetEsme Book-a-Day! "Dear Miss Breed, How will I do it? Do what? Why, thank you, of course. For what? For the simply splendid books, naturally. Every single one is almost as dear as you are, but not quite." After December 7, 1942, over 110,000 Nikkei (Americans of Japanese descent living on the West Coast) were identified as a "threat" to our nation and relocated to designated camps such as Santa Anita, also known as "San Japanita." Miss Breed worked with the San Diego Public Library, and was mortified by the turn of events that made enemies out of citizens. She gave her young patrons self-addressed postcards so that she could keep tabs on their location, and continue to serve them as best as she could. 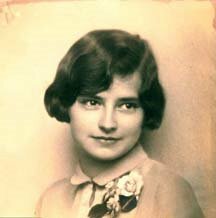 Through letters, supplies and outspoken articles, she offered support to the children and families she served before the war, even sending books so that the children's love of reading could continue in these dire circumstances. The correspondence serves as a remarkable testament to this strange and heartbreaking chapter in American history. An astonishing, even overwhelming amount of research went into this book, including a number of strong images such as the "How to Spot a Jap" instructional cartoon, and an uncomplimentary editorial by Dr. Seuss that serve to illuminate the climate of the time. Though it may be a bit bulky for the average reader, it is sure to raise both the ire and the level of historical knowledge of any justice-seeking middle-schooler, and is an inspiring must-have for background knowledge of any educator. Pictured: the real Miss Breed! What a sweetheart, what a spirit! GHOST GIRL by Delia Ray (Clarion) Historical fiction based on the true story of a life-changing relationship between an Appalachian girl and a teacher sent to her community by the Hoover administration. (10 and up) Delia Ray is a relatively new writer of unusual sensitivity who deftly handles conflicts between haves and have-nots; check out her latest book about a hearing child with evangelical deaf parents, SINGING HANDS (11 and up). Illegal cheese hunters are trapping helpless creatures beneath the city, as part of a nefarious plot to build a giant monster and embody the spirit of general mischief and megalomania. It us up to our hero! Arthur! Sweet, banana-stealing Arthur! Who takes good care of his cantankerous granfather and finds himself stuck in the world above the ground! Not to fret; he makes fast friends with some very dear allies: boxtrolls, cabbageheads, and a gentle lawyer named Wilbury. I have not been this excited about a book in a long time. Outstanding! Outstanding! Outstanding! Oustanding! Well, what makes this book so outstanding? In some ways, Alan Snow is kicking it Old Skool. I guess his style is going to end up being compared to Roald Dahl just because he is so irreverent and British, and because his book features the theme of child as hero, as do so many enduring works of children's literature. However, a more apt comparison may be to Tove Jansson, because his books have a greater undercurrent of kindness (grownups are not unilaterally villified), and because he has a fully inventive, imaginative world that is drawn not only in colorful, humorous language but in wildly generous illustration! There are over six hundred drawings in this book, at least one on every page! But even above and beyond being able to make the comparison to legends of children's lit, the qualities that I am most excited about belong truly and uniquely to Alan Snow. One is the pure, unadulterated imagination that went into this book; the story is definitely wacky, but manages to keep a strong pace and narrative flow. Two is the joy. This volume is a whopper, 529 pages, and on every single page, there is an unmistakable delight in the writing; as if the author is every bit as excited to tell you what happens next as you are to find out, and every picture is just another thing that the author was happy to do so that you would know this world, enjoy this adventure, and root for this boy. Though the book is thick, the print is large and well-spaced, and the text has lots of relief via the illustration, which gives further visual cues to children who may just be finding their footing in chapter books. Alan Snow started as a picture book creator, which might explain why he is so adept in marrying the words to artwork, and the overall effect is very fresh, creating a reading experience suitable for a generation of kids that is so visually literate. Besides soaring through this zany and original adventure, children are going to feel a sense of great accomplishment and reading confidence upon this book's completion. In so many ways, this is a perfect book for the intermediate-aged reader. Without sacrficing great storytelling, the writing has no pretensions or nose-up literary poo-di-doo, and likewise, there are no skills that need to be feigned or magnified in order for the average reader to enjoy this book (as opposed to another bestseller That Shall Not Be Named). It also rates as a marvelous read-aloud. Okay, here's the thing. My little boy is going into the sixth grade, and so far, every year of his schooling (excluding the year he was homeschooled) he had to do some sort of "Me" project: a poster about Me, an essay about Me, A big-box-o-Me. Don't get me wrong, I'm an awfully big fan of Him, and recognized it for the self-esteem boost it was probably intended. Still, I started to question the viability of the annual All-About-Me round-up. Personally, when I was a kid, I found the best way to find out about Me was to read about Somebody Else, and to recognize the bits and pieces of who I wanted to be. So, in the usual spirit of borderline political incorrectness, I challenge us to a Somebody Else Summer. Just think: if you were to share just one children's book biography a week, by the end of the season your child will have been introduced to at least ten amazing figures in history: artists, politicians, athletes, scientists, peacemakers. So, culled from the PlanetEsme archives plus one new book-of-the-day, I offer you a baker's dozen to get you started, in the hopes that come fall, when a teacher asks, "does anyone have any heroes or any idea what they would like to be when they grow up?" Your child can raise a hand and shout, "ME!" On a ranch in the Arizona desert was a family thriving on eighty acres, until the great drought drove them all to migrant work. Though their crops may have withered, a seed was germinating in young Cesar Chavez. The indignities he experienced as a shy Spanish-speaking student and the grueling conditions are honestly portayed. Children will be stirred by these indignities, and their hearts equally swelled by the huelga, Chavez's peaceful movement against threatening overlords. His three-hundred mile march from Delano to Sacramento was the longest in U.S. history, and resulted in the first ever contract for farmworkers. This is an extremely powerful book that underscores the bravery and resolve it takes to engage in non-violent protest, and rightly puts Chavez on the same scaffolding as Martin Luther King as a champion of civil rights. The lush illustrations roll across double-pages horizontally set, thoughtfully designed as to emphasize distance: how far the people had to travel both spiritually and physically to achieve the goal. A page-turning read-aloud about an important chapter of Latino history, this is a welcome and well done contribution to the shelves of children's biography. Viva la Causa! 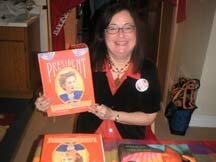 (7 and up) Oh, and just look at Kathleen Krull visiting the PlanetEsme Bookroom to share another one of her must-reads,A WOMAN FOR PRESIDENT: THE STORY OF VICTORIA WOODHILL (Walker)! She has many outstanding biographies available, and may I say, what a cutie! Kathleen Krull for president! The man who started out playing a horse's rear end rises to becoming a studio head in this true story of the turn of the century filmmaking legend Mack Sennett, who brought us Charlie Chaplin, W.C. Fields, the Keystone Cops and the very first pie in the face. Mack worked so hard that his hair turned white, and sometimes oversaw his slapstick crew from a bathtub in a tower in the middle of the movie lot. Understated sepia-toned watercolors capture the tone of a simpler time. With this tribute to a man who had "reel" faith in the funny, Brown has made yet another exceptional contribution to the shelves of children's biography. Be sure to follow with a showing of a silent movie like The Gold Rush (try to get one without narration and with piano accompaniment featuring Chaplin's score to get an authentic old-time feel).